Submitted 7 months 2 weeks ago by specialK. 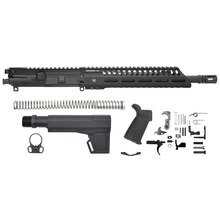 Chambered in 5.56 NATO, the Stag 15 VRST S3 Pistol Kit is a Mil-Spec AR builders kit with everything you need minus a Stripped Lower Receiver. Built around a 11.5" Carbine-Length, Chrome-Lined 1/7 Barrel with a Low Profile Gas Block, the VRST S3 Pistol Kit is outfitted with the new Diamondhead 8.25" VRST Series 3 M-LOK Free Float Handguard, Magpul MOE Pistol Grip and KAK Shockwave 2.0 Blade.